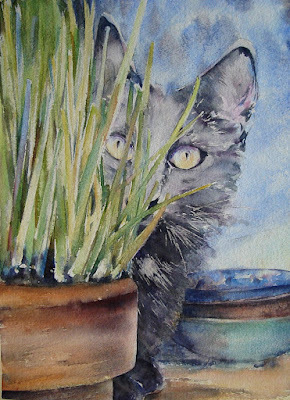 I am almost done with the cat painting....there's something bothering me, and I don't know what it is, so I'll wait and see for some time. My eye wants to go to the cat first but is pulled to the plants instead. I would probably tone down the values on the plants and increase the intensity in value on the eyes. Just my suggestion. My eye is drawn to the bowls. I can really sense the texture.